Indian Government is betting big on ‘Make in India’ initiative, in-house development of Electric Vehicle motors, propulsion systems and fast chargers has also been undertaken by the company. 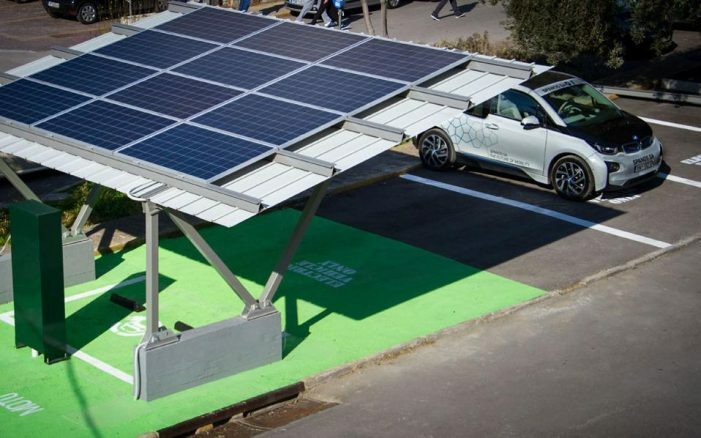 State-owned Bharat Heavy Electricals Ltd (BHEL) recently released a press release that it will set up a network of solar-based electric vehicle chargers (SEVC) on the Delhi-Chandigarh highway. “The establishment of EV chargers at regular intervals over the entire 250 km stretch between Delhi and Chandigarh would allay range-anxiety among the electric vehicle users and bolster their confidence for inter-city travel,”. India’s consistent endeavor for increasing usage of electric vehicles to reduce vehicular pollution and cut dependence on cude oil imports. However, infrastructure for charging the batteries in such vehicles is very crucial for achieving that objective. BHEL said it will design, engineer, manufacture, supply and instal the EV charging stations along with a central monitoring system. Each SEVC charging station will be equipped with a rooftop solar power plant to supply green energy to fast and slow chargers planned to be installed at the location. It, however, did not say who will operate the charging stations and if any charges will have to be paid by the vehicle owners for using the facility to charge their vehicles. “The project is covered under the FAME scheme [Faster Adoption and Manufacturing of (Hybrid &) Electric Vehicles in India] of the Department of Heavy Industry (DM), Government of India,” it said. As part of its diversification initiative, BHEL has been expanding its footprints in the e-mobility business. It has already installed DC chargers at Udyog Bhawan in New Delhi. BHEL is also executing another commercial order for installation of DC chargers across various locations in the country. The company is extending its offering in the e-mobility segment and has equipped itself to foray into manufacturing of EV chargers, electric buses and related critical components, the statement said. As part of the ‘Make in India’ initiative of the Government of India, in-house development of EV motors, propulsion systems and fast chargers has also been undertaken by the company.